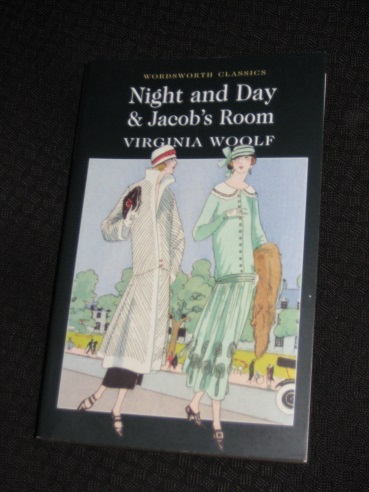 Night and Day, Woolf’s second novel, set in pre-WWI London, focuses on two main characters, Ralph Denham and Katharine Hilbery. The story traces the course of their relationship from a first encounter at an afternoon tea at the Hilbery’s comfortable Chelsea mansion through a number of meetings, and the complications of other romantic entanglements, with the pair struggling to admit their true feelings to themselves or those around them. One of the obstacles in their way is the class gulf between them. Ralph lives in an old house in the suburbs with his widowed mother and a horde of brothers and sisters; Katharine, meanwhile, the granddaughter of a famous poet, lives a life of ease in a fashionable part of London, spending her time entertaining guests along with her parents. However, despite the difference in their backgrounds, there’s a spark between them, which gradually builds a connection allowing them to show their true selves in the other’s company. In a novel like this, there are bound to be complications, and these are provided here by the supporting characters. Ralph is initially drawn to Mary Datchett, a young woman working in an organisation fighting for female suffrage, while William Rodney, a well-to-do would-be poet, is Katharine’s suitor. Then there’s Cassandra Otway, Katharine’s flighty cousin. Her visit late in the novel proves to be the final catalyst required to bring the main relationship to the boil, with Ralph and Katharine forced to decide whether they will follow their hearts or common sense. Night and Day has a very different feel to other Woolf novels I’ve read. It’s fairly long, and its romantic focus lends it the air of a Victorian novel, with more than a nod to works by the likes of Anthony Trollope (a feeling enhanced by the time the London contingent spends in the country). It’s not always successful, and in fact Dorinda Guest’s excellent introduction describes it in places as a story where little happens; it’s certainly true that drama is at a minimum in the novel. “She loves me,” he thought. The woman he admired more than anyone in the world, loved him, as he had given up hope that she would ever love him. And now that for the first time he was sure of her love, he resented it. He felt it as a fetter, an encumbrance, something which made them both, but him in particular, ridiculous. He was in her power completely, but his eyes were open and he was no longer her slave or her dupe. He would be her master in future. This comes from the mind of William Rodney, but he shouldn’t be so sure of himself. Feelings, like thoughts, change constantly, with the characters unable to work out what the other is thinking, and usually unwilling to ask. The novel is full of stark contrasts between opposites and extremes, whether it’s Ralph and Katharine, Katharine and Cassandra or London and the country. The home lives of the main protagonists are clearly different, with the (relative) poverty of Ralph and Mary in their cramped homes unmistakable. However, Katharine’s life is not as perfect as it first appears, as her beautiful home takes on the form of a gilded cage. She allows herself to be pulled into the impossible task of assisting her flighty mother in the writing of her grandfather’s biography, and far from providing a stimulating diversion from boredom, this becomes a stone weighing her down and dragging her back into the past. Katharine is also struck by the contrast. The Ralph of the daytime is gentle, amusing and courteous, but during the long evening walks through the streets of London, the pair struggle to share their emotions, as if the fading of the light causes the couple to close off their emotions to one other. I really loved this one, it doesn’t really feel like Woolf at all, but I so love those traditional English novels I couldn’t help but love it. I think VW’s true brilliance though shines out of Mrs Dalloway, To the Lighthouse and Orlando. Ali – Yes, I was rather surprised when I started reading this as it felt like a book by many other writers, just not Woolf! It does sound rather Victorian and inessential. Given how much great Woolf I have yet to read I think I’ll have to leave the lesser Woolf for now. Good luck getting back to your reading! Max – Well, we all have to start somewhere (it would have been a bit too impressive if Woolf had kicked off her career with ‘Mrs Dalloway’ and ‘To the Lighthouse’! ).